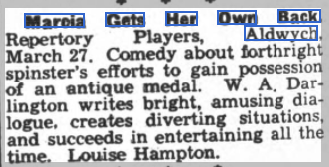 The Stage - 31 March, 1938. The Aldwych, London. "Charles Mortimer gave a good rendering of the part of Sir George. He combined to a nicety the big business man's dictatorial methods with the charm of the genial host." Charles Mortimer played Sir George Winter, in "Marcia Gets Her Own Back", at the Aldwych Theatre, London, on 27 March, 1937. The play involved Maria gaining possession of an expensive medal.